THE BLEACHER BRIEFINGS: The Return of Rip City? The Return of Rip City? 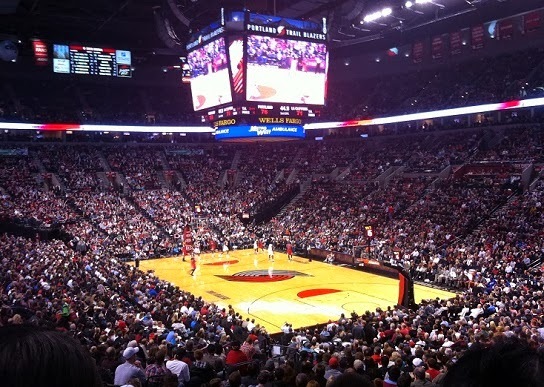 As an avid NBA follower, I've always appreciated the Portland Trail Blazer franchise and all the knowledgeable fans who occupy one of the loudest buildings in the entire league. Unfortunately, this team has been snake bitten numerous times. Whether it was Bowie over Jordan, Oden over Durant, or the long injury saga of Brandon Roy, it seems as if a dark cloud has hung over the organization for a long time. Over the last two years, the Blazers stumbled to a 61-87 record, and people began to question if huge changes were in order. Heading into this season, there were low expectations in "Rip City," with rumors of LaMarcus Aldridge being moved and major concerns about the bench. Few expected the Trail Blazers to competed in a deep and talented Western Conference. But two months and 32 games later, Portland finds themselves as one of the top teams in the West. A year ago, head coach Terry Stotts attempted to play a "small ball" style with J.J. Hickson spending a ton of minutes at center. In the offseason, the Blazers signed Robin Lopez, and he has been a surprising anchor in the middle. Outside of the change at center, there weren't any real wholesale roster moves made, which makes this story even more incredible. The key to Portland's resurgence has been the work of their starting five; Damian Lillard, Wes Matthews, Nic Batum, Robin Lopez and LaMarcus Aldridge. These guys seem to have a chemistry that very few staring units in the NBA share. The great play has been there, in part, because this lineup has started every game together this season. One of the fascinating things about this Portland offense is their willingness to take mid-range jump shots and 3-pointers at blistering clips. In this era of basketball, many offenses are set up off the dribble drive, with the potential to kick out to 3-point shooters. The Blazers don't use the drive very much, and without a true post-up presence, they take, and make, a lot of long-range shots, currently ranking 1st in 3-point field goal percentage. As it sits, Portland is the top scoring unit in the NBA, primarily because of their ability to improvise, and when a set play needs to be run, the starting unit knows exactly where to be at all times. On the defensive end, they're still a work in progress, currently sitting 26th in the league in points per game. Lack of foot speed between guys like Matthews, Lopez and Aldridge is part of the reason for the lack of stops. It isn't a matter of effort. Still, Portland will have to get better on that side of the ball when they face offenses like the Thunder, Clippers, Rockets and Warriors as the season progresses. The bench was a serious issue a year ago, and it hasn't gotten much better, with Mo Williams, Dorell Wright and Joel Freeland being the main guys in the rotation. In the second half of the season, coach Stotts will have to decide if he's going to sacrifice wins for rest as the playoffs draw near, or continue to play all of his starters 30+ minutes a game and risk tiring them out by the time the postseason tips off. Certainly something to keep an eye on moving forward. Regardless, the Trail Blazers have been a fun team to watch this season, with Damian Lillard drilling big shots on a regular basis and LaMarcus Aldridge registering 20 and 10 almost every night out. While they've hit of a rough patch of late with losses to both the Heat and Pelicans, unlike the other top teams in the West, Portland is playing with house money and lower expectations the remainder of the season. That means they're less likely to feel pressure in the playoffs. And that makes them dangerous. They are fun to watch but it won't last. Not enough size inside and lack of depth will eventually catch up to them. Love Lillard's game. He's one of my favorite players in the league. Hope they keep playing well.